Though Super Star Rajini's Kuselan is getting mixed reports in the actor's homeland, it has got rave response in other states like Kerala and countries like Malaysia – Singapore. According to the reports, Malaysian audiences see superstar Rajnikanth's latest film Kuselan since it is a blend of a good story and fine acting. K.N. Vijayan, a noted film critic of the South-East Asian nation told in his report in New Strait Times, "Such is the power of a good story that it can be appreciated all over India in diverse languages. " Urging Malaysians to 'watch this one with the family', Vijayan said: "The last few minutes of the film draw a tear or two. 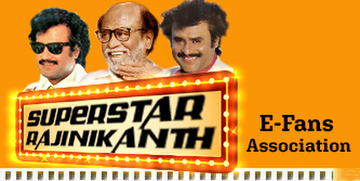 That's when Rajnikanth proves how good an actor he is. Also, whoever wrote the speech that Rajnikanth makes in the film, needs a special award." Below picture taken on 15 August 2008 (Friday) at Yishun Theater Ticket Counter, Singapore. Update from Singapore Member on 25 August 2008. 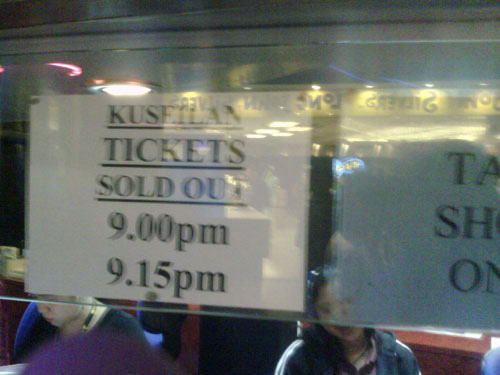 This week they removed Kuselan from 9.15 PM Show in Yishun 9 and added an extra show for Sathyam on Friday and Saturday. From Sunday they re inserted Kuselan back removing Sathyam. What does this indicate?, Kuselan a flop movie (As per media and some theatre distributors in TN) is replacing a latest movie.This shows Kuselan is doing far better than the new release. One may argue that both are not doing that well, in that case the theatre owner could have just left it with Sathyam or replaced with any other of his old movies?